Next-Gen Diagnostics, Nanotechnology, and Bioengineering Begin Taking the Fight to Cancer | Singularity HUB. A new implantable brain chip developed by the University of Madison-Wisconsin may help advance our understanding of the human brain. The chip is flexible, transparent, biocompatible—and uses a graphene sensor array just four atoms thick. To understand a system, we have to observe it, and so far, observing the living brain has proven challenging. Current observation methods of structure and activity tend to interfere with each other, so we can choose structure or activity, but generally not both. “Historically, we’ve kind of looked at one or the other: we either take high-resolution imaging to look at how the brain is structured, or we poke and prod it with electrodes to try and measure its activity,” Justin Williams, a UW-Madison professor of biomedical engineering and an author on a paper detailing the implant, toldMotherboard. Ideally, of course, researchers would like to look at both structure and activity at the same time. The problem? The implants used to directly measure signals in the brain tend to block the view of imaging techniques intent on recording brain structure. Graphene, the much-lauded (but still experimental) supermaterial may offer a solution. In its purest form, graphene is a one-atom-thick lattice of biocompatible carbon. The device’s sensor, comprised of just four sheets of graphene, is extraordinarily thin—this accounts for its flexibility and transparency. Further, because graphene is highly conductive it can be used as a sensor of electrical activity in the brain. Taken together, the sensor is thin (and robust), transparent, flexible, and conductive—it can measure brain activity without interfering with other instruments. Transparent Graphene-Based Implants to Grant Clearer View of the Brain | Singularity HUB. Not so long ago we covered a miniature, ant-sized computer chip designed to be embedded in everyday stuff to make it smarter. Instead of a cumbersome battery in need of constant recharging—the chip is powered wirelessly by radio waves. Now, the same Stanford group, led by assistant professor of electrical engineering Amin Arbabian, is working on a sister chip destined to be implanted in the body to keep tabs on internal biological processes and distribute drugs and other therapies. To date, medical implants bristle with wires or, when they’re wireless, are made bulkier by onboard batteries. Ideal implants would be wireless and battery-free. Unlike chips to be embedded in inanimate objects, implanted chips need to be fully compatible with the human body and present minimal health risk. To that end, Arbabian chose ultrasound to power his chip. Ultrasound is already safely used for sensitive procedures, like fetal imaging, and can provide the needed power. How does it work? The chip houses a special piezoelectric material that flexes in response to incoming ultrasound waves creating a small amount of electricity. “The implant is like an electrical spring that compresses and decompresses a million times a second, providing electrical charge to the chip,” says Marcus Weber, a Stanford graduate student who working on Arbabian’s team. Arbabian’s team found their device responded to targeted ultrasound through three centimeters of chicken meat—their human flesh analog. Futuristic Medical Implant Powered by Sound Waves | Singularity HUB. Not long ago, we told you about a patient who received a stem cell treatment for degenerative eye disease. In that story, researchers took the patient’s skin cells and turned them into induced pluripotent stem (iPS) cells that were then made into retinal cells for transplantation. Now, researchers from Washington University in St. Louis have successfully skipped the intermediate stem cell stage and directly produced neurons from skin cells. While this study, published last week in the journalNeuron, was conducted in mice, it provides important evidence that this treatment option could be feasible for humans in the future. The scientists, led by Dr. Andrew Yoo, were interested in producing a particular type of brain cell known as medium spiny neurons. These are the cells most affected by Huntington’s disease, a neurodegenerative disease that results in the gradual loss of muscle coordination and cognitive ability. Almost all people affected by the disease succumb to it within 20 years after the onset of symptoms. After the discovery of iPS cells in 2006, many researchers attempted to skip the stem cell stage altogether in the hopes of producing whatever type of cell is needed. Varying levels of success have been reported in the scientific literature since then, first using mouse cells and then human cells. Scientists have created a few types of neurons using this approach, includingoligodendroglial cells, which are affected by multiple sclerosis and dopaminergic neurons, which are destroyed by Parkinson’s disease. Now, Dr. Yoo’s group has gone beyond just producing these cells and has successfully transplanted them into mice. During the months following transplantation, they found that the neurons behaved exactly as if they were native cells, growing and making connections to other parts of the brain. Skin Cells Converted Directly to Neurons in Effort to Reverse Huntington’s Disease | Singularity HUB. I’ve seen complicated formulas and math talking about the possibilities of your massive profits on Tsu. Whatever numbers and magic hoopla you’d like to put, In my opinion Tsu is a scam. Spend your time on your OWN website creating your OWN content and spam your network with that..
Why should you listen to me? I own a social network. Yup. Girlfriend Social is the largest women only friendship social network in the world. I use advertising on the site but also offer members the option to pay for upgrades so they don’t have to see or be a part of advertising. I know exactly how much money it costs to keep servers going, continue to pay for advertising, keep security going and a million other things that running a major website does.I also own several blogs and other websites that use affiliate marketing and advertising models. I’ve been doing this part of the internet for many many years. Is Tsu a Scam? 6 Things to Consider – Amanda Blain. Daniel Graf, Twitter’s head of product, is out after only six months. He’s keeping the title — VP of Product — but he has been demoted to work on “strategic initiatives” instead of running the consumer product team, according to a Wall Street Journal source. Kevin Weil, a longtime Twitter employee and current head of revenue products, will be stepping into the product lead position. Graf’s demotion comes only a day after news that two of Twitter’s top engineers, including its head of Analytics, had resigned. The revolving door of employees has not markedly improved Twitter’s big problem:slowing user growth. There has been tension over the best way to tackle the issue — see the controversy over algorithmic filters, among other experimental features. More changes at Twitter as its head of product is replaced — Tech News and Analysis. DNAnexus, a Mountain View-based startup that leverages the cloud to turn raw DNA sequences into useful data, announced today that Regeneron Genetics Center is the latest health care company to use its system to search for new drugs. The startup is already sifting through 1,000 exomes–the 1 percent of the human genome that is most relevant to health–each week, stripping away any information that could tie it back to its source while pulling out the interesting data points that can help laboratories and companies connect genes with different health problems. Institutions can use the pool of information to quickly search for a new drug or even a diagnosis for a single patient. While the time and cost to sequence an entire genome has dropped to a day — or hours — and $1,000, from the 13 years and nearly $3 billion it took to complete the internationally-run Human Genome Project, more obstacles remain. It takes far more work and time to analyze the raw data of a genome in order to make it useful. Enter companies like DNAnexus, which specializes in transporting DNA information directly from a sequencing machine and into the cloud, where it can be crunched into meaningful information. Cloud computing allows DNAnexus to translate a set of data in a week that might otherwise take six months at a data center. Regeneron is the first DNAnexus partner to handle its DNA exomes 100 percent in the cloud. “It’s just an enormous reduction in the time and expense it takes to do this,” CEO Richard Daly said in an interview. Cloud computing is coming for your DNA, and it will lead to better drugs and health care — Tech News and Analysis. Laws and regulations differ from state to state, as does insurance coverage and acceptance within and without the medical field, but millions of Americans are now getting some form of care by video. Forget house calls: What doctors can (and can’t) do remotely with telehealth products — Tech News and Analysis. We know Google as a search company, and now as an email and social media company. But it sees itself as much more, and nowhere is that more evident than its secretive Google X laboratory. Its team there tackles “moonshots,” which can mean anything from delivery drones to glucose-monitoring contact lenses. Monday saw the announcement of yet another unexpected project: health diagnostics. Google X has been working on nanoparticles that, after consumed, stream through the human body and pick up on signs of waning health — cancer cells, for example. The nanoparticles then congregate at a band worn on the wrist to report their findings. It’s a bold goal that could suddenly move expensive, time-consuming and difficult tests from a hospital to anyone’s pocket. How exactly can Google, of all companies, do that? What are nanoparticles? Are they really OK to eat? 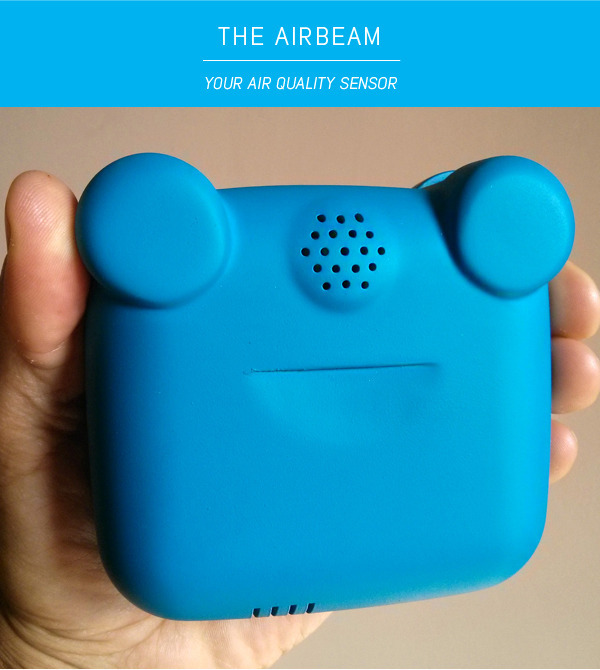 HabitatMaps has launched a crowdfunding campaign for an air quality monitoring sensor that it wants people to wear so it can collect data on pollution in New York. The campaign is more about generating publicity and covering the costs of manufacturing the sensors, but the approach to gathering data shows one of the promises of the internet of things. HabitatMaps is an environmental justice group formed in 2006 that started out trying to make interactive online maps of places filled with historical facts and information for residents. In 2011 it released an Android App called AirCasting that used the microphones on the phone to measure noise pollution. From that point on its focus changed to take advantage of smartphones and sensors to gather data that would be more complete and relevant to fight pollution.